Expect a snowy approach ’til mid July. 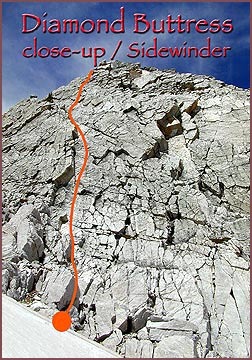 This formation provides several great moderate, long routes. It’s about 700 feet from bottom to top. Great climbs here (more descriptions coming). Descent is by 1.) the MBPT, 2.) the South Couloir after meltout, or 3.) the quick rap route (down the ‘White Gash’-Keyhole’) as indicated on the topo. 1.) Sidewinder, 5.8, three pitches of moderate, recreational climbing.. P1: Follow the long right facing dihedral and the face to the immediate right to just below the tree and belay. 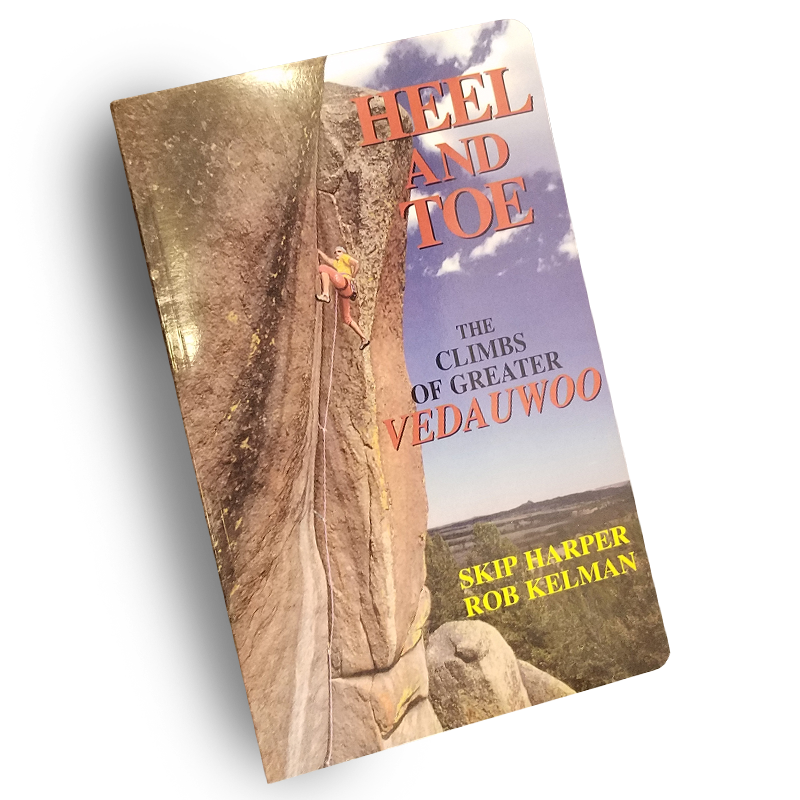 P2: Face climb working past a 30 foot right facing dihedral and vertical cracks past two minor ledges – belay on the third ledge below a band of white rock.. P3: Climb up a broken face over an inverted V roof and continue to the top, staying left of a large blocky left facing dihedral. 2.) Medicine Man, 5.9+. Superb. P1: Begin at the start of a long right facing dihedral in the middle of smooth white rock roughly 75 feet left of #1. 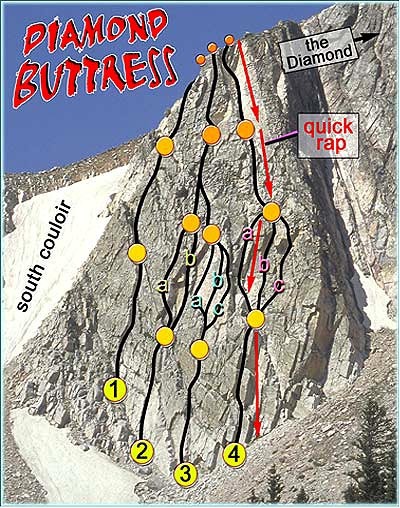 Continue through an abrupt transition between white and unstable gray rock and belay on the second large ledge below a roof/dihedral system. P2: Variation A, 5.8, Move directly up a right facing dihedral. Turn the roof and face climb about 90 feet. Variation B, 5.9+, Move about 60 feet up a crack system staying right of the large dihedrals. Then climb the dihedrals and face to a ledge. P3. Climb low-angle broken rock and belay under a large brown roof. P4: Turn the roof to the left and climb steep face to the top – stay right of the large dihedral. 3.) Paleface, 5.10d (‘a’ and ‘b’ on the Pale Face are 10 hard only! The rest is 9+ or less). Great variants on the pale face, ‘a’ and ‘b’ are quite sporty, use fine wires and Lowe Balls. Watch spacing on the belays! P1: Begin at the center of the buttress at a large, incut alcove covered with tundra. Take the right facing, blocky dihedral up into grey rock. Belay on a small shelf at about 150 feet, or continue another 25 feet to a larger ledge. P2: Variations from the large ledge. 9a (5.10c) Move left 25 feet, climb a thin right arcing crack. 9b. (5.10d) Move left 10 feet and climb the middle crack. 9c. (5.10a) Continue straight up the crack you’re in to an arete. P3: Move up and left to merge with Medicine Man. 4.) The Flying Buttress, 5.10c (roof on ‘c’ only! The rest is 9+ or less). First two pitches are superb. Last two are scrambles up the ‘White Gash’ to the top. NOTE: There are bolted belays on this route which also function as a quick rap descent. P1: Begin slightly downhill from three large stacked dihedrals. Climb a continuous right facing dihedral to bolt anchors near a tree. P2: Variations: 10a (5.8+) Go left and up a slanting corner to a large shelf with bolt anchors. 10b (5.9) Take on the steep broken face under the large ‘keyhole”. Move up between two blocky roofs to the bolt anchors. 10c (5.10c) Climb broken face to a large roof. Turn the roof on the right side to the bolt anchors. P3: Easy ground up the White Gash to the anchors. P4: Climb the arete. Watch out for loose rock here! Find anchors at the top.